Pumphouse Coffee Roasters began brewing in April 2016. After four years of researching the industry and two years of roasting for friends and family out of their parents’ garage, the LeClainche brothers made it official and opened their 1,300-square-foot roastery in Jupiter Commerce Park. Owners Alex and Christian were born in Miami and raised in Palm Beach County. They both attended the University of Central Florida, where they studied Hospitality and Business, respectively. When the time came to name their coffee venture they bounced ideas back and forth but it wasn’t until Christian was in Austin at a latte art throw down that he received a call. Alex’s wife, Annalyse, had proposed the name “Pumphouse,” a nod to the local landmark where the boys had grown up playing and learning to surf. They both agreed it was perfect and now a sketch of the locally famous beach spot serves as their insignia and is a theme throughout their business. 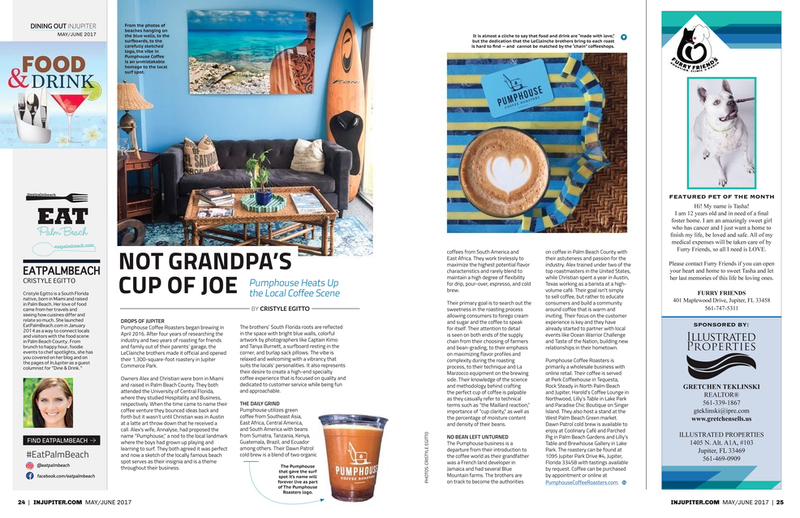 The brothers’ South Florida roots are reflected in the space with bright blue walls, colorful artwork by photographers like Captain Kimo and Tanya Burnett, a surfboard resting in the corner, and burlap sack pillows. The vibe is relaxed and welcoming with a vibrancy that suits the locals’ personalities. It also represents their desire to create a high-end specialty coffee experience that is focused on quality and dedicated to customer service while being fun and approachable. Pumphouse utilizes green coffee from Southeast Asia, East Africa, Central America, and South America with beans from Sumatra, Tanzania, Kenya, Guatemala, Brazil, and Ecuador among others. Their Dawn Patrol cold brew is a blend of two organic coffees from South America and East Africa. They work tirelessly to maximize the highest potential flavor characteristics and rarely blend to maintain a high degree of flexibility for drip, pour-over, espresso, and cold brew. Their primary goal is to search out the sweetness in the roasting process allowing consumers to forego cream and sugar and the coffee to speak for itself. Their attention to detail is seen on both ends of the supply chain from their choosing of farmers and bean-grading, to their emphasis on maximizing flavor profiles and complexity during the roasting process, to their technique and La Marzocco equipment on the brewing side. Their knowledge of the science and methodology behind crafting the perfect cup of coffee is palpable as they casually refer to technical terms such as “the Maillard reaction,” importance of “cup clarity,” as well as the percentage of moisture content and density of their beans. The Pumphouse business is a departure from their introduction to the coffee world as their grandfather was a French land developer in Jamaica and had several Blue Mountain farms. The brothers are on track to become the authorities on coffee in Palm Beach County with their astuteness and passion for the industry. Alex trained under two of the top roastmasters in the United States, while Christian spent a year in Austin, Texas working as a barista at a high-volume café. Their goal isn’t simply to sell coffee, but rather to educate consumers and build a community around coffee that is warm and inviting. Their focus on the customer experience is key and they have already started to partner with local events like Ocean Warrior Challenge and Taste of the Nation, building new relationships in their hometown. Pumphouse Coffee Roasters is primarily a wholesale business with online retail. 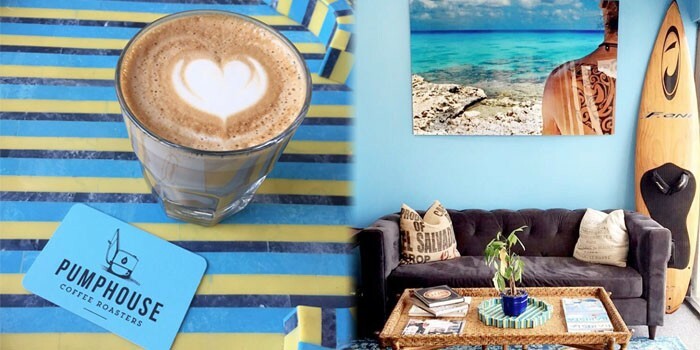 Their coffee is served at Perk Coffeehouse in Tequesta, Rock Steady in North Palm Beach and Jupiter, Harold’s Coffee Lounge in Northwood, Lilly’s Table in Lake Park and Paradise Chic Boutique on Singer Island. They also host a stand at the West Palm Beach Green market. Dawn Patrol cold brew is available to enjoy at Coolinary Café and Parched Pig in Palm Beach Gardens and Lilly’s Table and Brewhouse Gallery in Lake Park. The roastery can be found at 1095 Jupiter Park Drive #4, Jupiter, Florida 33458 with tastings available by request. Coffee can be purchased by appointment or online at PumphouseCoffeeRoasters.com.